Please note that tickets for Commencement 2019 will become available for students to request on March 6th, 2019 at 12 AM. Graduates eligible to participate in Commencement 2019 can reserve one ticket for themselves and up to five guest tickets. You will also have the option to request up to three additional tickets when reserving your student/guest tickets. This will automatically add you to the Commencement ticket waitlist. Please note: Eligible students will be able to reserve commencement tickets the day after applying for graduation. Initial student/guest ticket reservations ends April 30th. Waitlist ticket requests will be distributed on a first come, first serve basis starting May 1st. One ticket will be issued per faculty member. If you are participating in the ceremony, you will still need a ticket. Please click here to see all ticket reservation options available for faculty. One ticket will be issued per staff member who has volunteered. Please contact Jon Barker at jbarker@maine.edu for additional information. Graduates eligible to participate in Commencement 2019 will be brought to the landing page below. Click the 'Spring 2019 Commencement' link. Read through the event information and then scroll to the bottom of the page. Graduates should select a student ticket for themselves and up to five additional guest tickets. Graduates will also have the option to request up to three additional tickets. 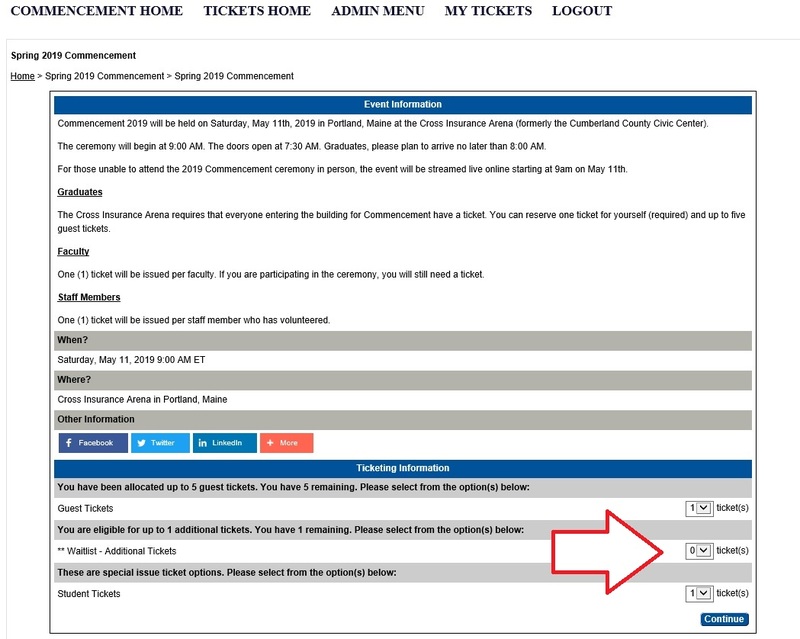 Requesting additional tickets will automatically add you to the commencement ticket waitlist. Waitlist tickets will be distributed on a first come, first serve basis starting May 1st (please note, being added to the waitlist does not guarantee that you will receive additional tickets to the commencement ceremony). Faculty and staff volunteers can select one ticket. Once ticket selection is complete, click 'Continue'. Review your order, then click 'Checkout'. Tickets are reserved for 10 minutes to allow time for you to change the quantity as needed. 8. Graduates will be prompted to complete a brief exit survey. Graduates who answer every question will be entered for a chance to win an iPad. Once done, click 'Checkout'. 9. Your ticket reservation is now complete. You will now have the option to 1) print your ticket(s) (Click on the corresponding 'Print/Save Ticket' PDF icon) and distribute them to your guests 2) send the tickets to each of your guests to print themselves (Click on 'Send to Friend'). You will receive an email confirmation to your maine.edu email address with your confirmation number, reservation summary and a link for your tickets. To reprint or view tickets, log in and click "My Tickets". If you experience difficulty or have questions about ordering your tickets, please contact jbarker@maine.edu.